Location: East side of Mare Street. 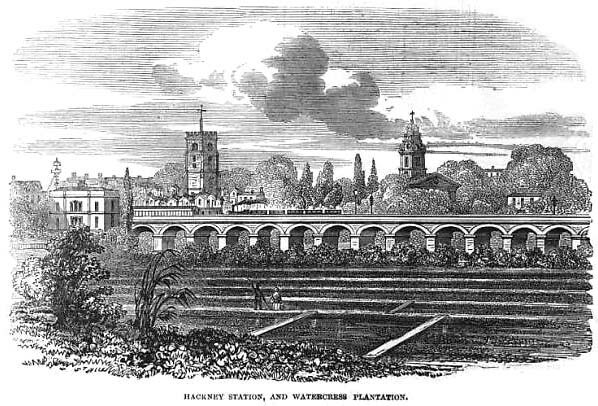 Notes: The original station at Hackney opened with the line. The station was resited to the west side of Mare Street and it is likely that the station was demolished shortly after resiting. The original idea for the North London Line came from the London & Birmingham Railway who was keen to reach the docks situated on the lower reaches of the River Thames. In order to achieve this aim, a new 8 mile line was authorised in August 1846 running from the North Western Railway's Camden Town Station to the West India Docks at Blackwall. Initially planned as a freight only line, by the time the first five mile section of the East & West India Docks and Birmingham Junction Railway opened between Islington and Bow on 26th September 1850, it was also provided with a passenger service with an intermediate station at Hackney and another at Kingsland (Dalston) opening a month later. A six road locomotive shed opened at Bow in 1850. There was a connection at Bow with the London & Blackwall line allowing trains to run into their City terminus at Fenchurch Street. The company was nominally independent although the LNWR subscribed 67% of the capital. The extension to Camden Town (Camden Road until 1870) was opened on 7th December 1850 and on to Hampstead Road (renamed Chalk Farm from 1862 and Primrose Hill from 1950) on 9th June 1851; beyond Hampstead Road there was a junction with the LNWR. The line was extended south from Bow to Poplar on 1st January 1852 allowing freight services to reach the West India Docks. The freight service was worked by the LNWR and was mainly merchandise from the docks but there was also some coal coming from the Midland Railway at Rugby. On 1st January 1853, the rather unwieldy East & West India Docks and Birmingham Junction Railway was changed to the North London Railway. 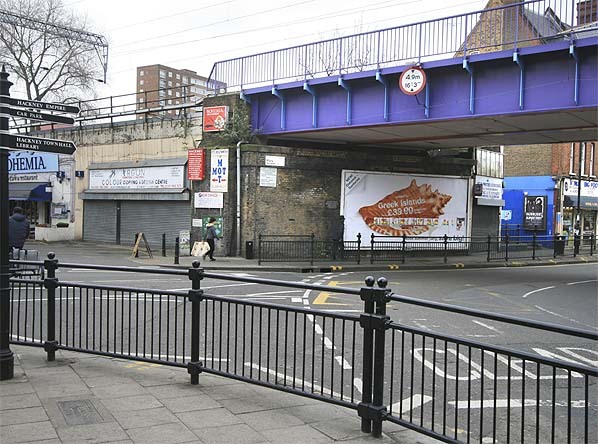 A connection was made with the Eastern Counties Railway (later the Great Eastern) at Hackney Wick in 1854 and Victoria Park station was opened north west of the junction in 1856 and the company opened its locomotive and carriage works south of Bow station in 1863. Newington Road & Balls Pond Station between Islington and Kingsland was opened in 1858 and a station was opened at Poplar, just north of the junction with the L & B in 1866. At this time, the through service to Fenchurch Street was withdrawn with trains terminating at Poplar with a shuttle service being introduced between Bow and Fenchurch Street and from 31st December 1868; this service was taken over by the Great Eastern. On the 18th May 1869 an eastwards spur was added at Bow onto the London Tilbury and Southern Railway allowing through running between Broad Street and Southend. After protracted negotiations the North London finally reached agreement with the London & Blackwall in 1870 for an eastern spur at Poplar allowing trains to reach Blackwall where passengers could catch the steamer services to Margate from Blackwall Pier. By this time however, the steamers were in decline and the train service was withdrawn in 1890 and the connection at Poplar was severed. The line was an immediate success and traffic steadily increased with 4.37 million passengers being carried in 1853 when some trains were extended from Hampstead Road over the LNWR to Willesden and Kew. To avoid congestion, the LNWR promoted the six mile long Hampstead Junction Railway between Camden Town and Old Oak Junction (Willesden) which opened on 2nd January 1860 and was operated by the NLR. By 1861, passenger numbers had reached 6.5 million the NLR decided to seek a more direct access into the city rather than the circuitous route into Fenchurch Street. 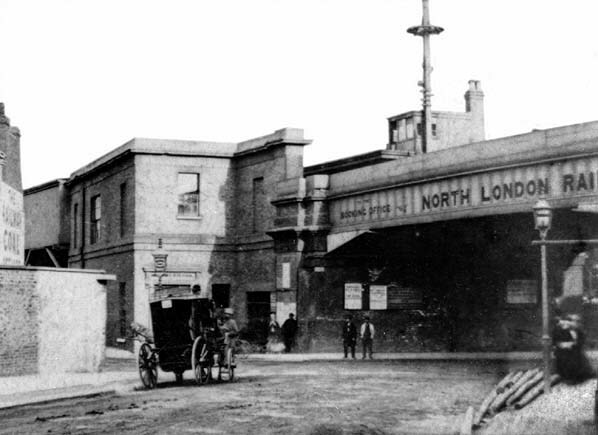 The 1861 North London Railway Act authorised the building of a triangular junction at Dalston where a new station would be built (replacing the station at Kingsland which closed), with a triple line running southwards for two miles, much of it on viaduct, to a terminus at Broad Street on the edge of the City. One intermediate station was built at Shoreditch with another added at Haggerston in 1867. Further intermediate stations were added on the original line at Old Ford (1867), Homerton (1868), Caledonian Road (1870), Mildmay Park (1880), South Bromley (1884) and Maiden Lane (1887). The Broad Street extension was very expensive to build and to save costs, the adjacent Broad Street goods station was built on two levels. Passenger traffic began on 1st November 1865 with the goods depot opening on 18th May 1868. The extension was referred to as 'the happy afterthought'; it was an immediate success with passenger traffic doubling to nearly 14 million in 1866; a fourth line was provided into Broad Street in 1874. On 18th January 1875 the Canonbury spur was opened giving access to the GNR network. The Bow locomotive shed was closed in 1882 and the building was incorporated into Bow Works. A replacement known as Devons Road was built further south and consisted of two 10-road Northlight sheds, of Webb LNWR design. For the next 50 years a 15 minute service ran from Broad Street over the Poplar line, another 15 minute service ran to Hampstead Road calling at all stations while a third ran semi-fast to Camden with alternate trains running on to Watford and Richmond. Passenger traffic reached its peak of 46.3 million in 1896 by which date the line was beginning to feel the effects of competition from the tramway network; the NLR were unable to compete with the cheap tram fares. By 1910 the decline in passenger numbers has reached catastrophic proportions and in 1921 only 11.4 million passengers were carried. In 1909 the North London Railway went into joint management with the LNWR and in 1922 the latter company absorbed the NLR completely before itself becoming part of the LMS the following year. WW1 brought little change although Maiden Lane was closed as a war time economy measure and never reopened. Despite the shortage of men and materials the Broad Street - Richmond line was electrified in 1916 which brought a moderate increase in passenger numbers. The Poplar line however was never electrified and the North London line was never to recover its former glories. By the 1930's, the decline had been halted and passenger numbers were once again beginning to improve as East Enders began to enjoy a better standard of living and they were able to travel more following the introduction of cheap fares. This revival in fortunes was soon halted after the outbreak of WW2 and many of the North London stations were damaged during the nightly bombing during the blitz. One by one stations were forced to close following enemy action. Haggerston Station closed on 7th May 1940 followed by Shoreditch on 3rd October that year. Victoria Park closed on 1st November 1942 and the remaining stations of the Poplar line closed on 15th November 1944. The closure was described as temporary and all the booking office remained open issuing tickets for an emergency bus service calling at all stations. Just before the end of the war the bus service was withdrawn and the line was permanently closed to passengers although freight traffic to the docks ensured the lines future for many years. The lines to Richmond and Watford remained and the Richmond service was reputedly one of London's more profitable but this prosperity was short lived with passenger numbers once again in decline by 1955. The last steam locomotives left Devons Road shed on 28th August 1958 and it became London's first all diesel depot. The Richmond service was one of the few in London marked for the Beeching Axe in 1963. Strenuous opposition to closure by local authorities along the route brought a reprieve in 1965 and a modest modernisation scheme to cut costs was started in 1966, this involved singling the track out of Broad Street and removal of the junction to Poplar at Dalston. This ended any possibility of reopening the line to Poplar for which there had been much local support in the mid 1960's. Freight traffic was now also in decline as the developing motorway network made it more economical to transport freight by road. By the early 1980's the Poplar line had been reduced to the status of a long siding and freight traffic ceased from 3rd October 1983. On the 5th May 1984 the points at Victoria Park Junction were removed and the track south of Victoria Park was lifted shortly afterwards. The remainder of the line between Dalston and Victoria Park fared better. During the early 1970's there was a spirited campaign to reopen the line between Dalston and Stratford but nothing happened until the spring of 1979 when British Rail announced plans to reinstate the 'Missing Link' and introduce an hourly service between Camden Town and North Woolwich. Progress was quick with the line reopening for passenger traffic on 14th May 1979. Intermediate stations were later opened at Hackney Central (12.5.1980) Dalston Kingsland (16.5.1983), Homerton (13.5.1985) all on or close to the sites of the earlier stations. The opening of the new line marked the end for Broad Street however, from 13th May 1985 the Richmond service was diverted from Broad Street to North Woolwich leaving just a peak hour service to Watford Junction. The end was inevitable. Demolition of Broad Street Station started in the summer of 1985 with trains running into a temporary platform at the north end of the station. With the opening of a new connecting spur between the North London and the former Great Eastern line at Hackney the remaining. Broad Street trains were diverted into Liverpool Street bringing final closure to Broad Street and Dalston Junction on 30th June 1986. By the early 1990's the Watford Junction to Liverpool Street was reduced to just four trains Monday - Friday. This service was withdrawn in September 1992 with the closure of Primrose Hill station. As one part of the old North London line closed another reopened. By the 1980s, the docks were in complete disuse and the area became severely neglected. In 1982, the government decided to redevelop the area and encouraged construction and renovation on the disused docks for business and leisure. This was undertaken by the London Docklands Development Corporation which needed to provide public transport cheaply for the former docks area to stimulate regeneration. They chose a light-rail scheme using surviving railway infrastructure to link the West India Docks to Tower Hill and to a northern terminus at Stratford station utilising part of the former North London line between Poplar and Bow. Work began in 1984 with the construction of three branches, from Tower Gateway, Stratford and Island Gardens, the £77 million system was ready for use three years later and was officially opened by Queen Elizabeth II on 31 July, 1987. The Stratford branch used the track bed of the North London line from its junction with the former L & B at Poplar to a point just north of Bow station where it took a new route to Stratford running into a disused bay platform at the existing station. All Saints station was opened on the site of the North London's Poplar Station and at Bow, Bow Church Station opened on the south side of Bow Road, the original Bow Station having been on the north side; there was no direct replacement for South Bromley which was some distance north of the current Langdon Park station. In January 1997, the government granted the statutory planning powers for an extension of the East London Line. For much of its course, this line will utilise the existing North London Line viaduct. Although Broad Street Station has now gone, replaced by the massive Broadgate office development, the remainder of the route remained intact after closure. After the Government gave the go-ahead on 9th October 2001 on the basis of the line being funded through the Private Finance Initiative, the construction of the northern extension was due to begin in December 2001. However, it was held up when it came to light that the Grade II listed 19th-century Braithwaite arches in the former Bishopsgate Goods Yard were to be demolished as part of the project. Campaigners launched legal action against London Underground in an effort to prevent the demolition, but the project finally received legal clearance in the Court of Appeal on 7 July 2003. In phase 1, the line is being extended northwards from Whitechapel, with new stations at Shoreditch High Street, on the site of the old Bishopsgate goods depot, Hoxton, Haggerston and Dalston Junction, the latter two stations on their original sites. A further extension along the North London Line, through Canonbury to In phase 1, the line is being extended northwards from from Whitechapel, with new stations at Shoreditch High Street, on the site of the old Bishopsgate goods depot, Hoxton, Haggerston and Dalston Junction, the latter two stations on their original sites. A further extension along the North London Line, through Canonbury to Highbury & Islington for interchange with the Victoria line, North London Line and Northern City Line will open soon afterwards. It is now anticipated that the northern extension should open in 2010. The line has been franchised out to London Overground which was launched in 2007, when TfL took over part of the rail franchise for the existing North London line service from Richmond to Stratford from Silverlink trains; the line from Stratford - North Woolwich closed in November 2006. North Woolwich and Silvertown stations closed completely together with the North London Line platforms at West Ham, Canning Town and Custom House. The North London Line platforms at Canning Town and West Ham will be redeveloped as part of the extension of the Docklands Light Railway from Canning Town to Stratford International while the North London line platform at Custom House will be used by Crossrail's Abbey Wood branch. Today the only part the North London line that hasn't been reopened is between Victoria Park and Bow. Between Old Ford (including the station site) and Bow the route has been redeveloped, mainly for housing but between Old Ford and Victoria Park the track bed can still be traced for much of its length and the truncated viaduct that once carried the line over the A12 (formerly A102M) can still be clearly seen by passing motorists. Other web sites: Abandoned Tube Stations & South Park UK. Illustrated London News 15th November 1851. Click here for an account of a journey from Fenchurch Street to Bow and along the North London line to Hampstead Road. North London Railway Historical Society includes history plus details of Society publications, tours and speakers. 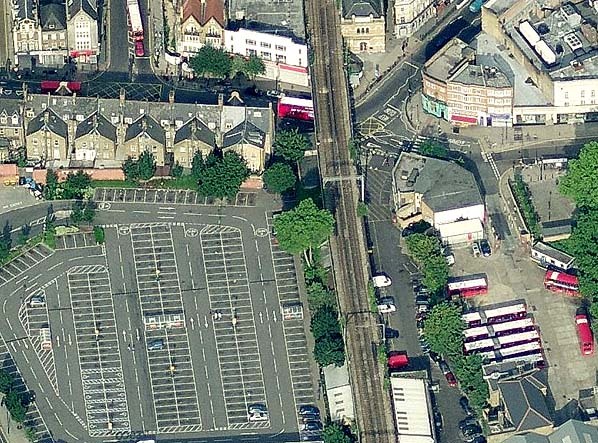 Aerial view showing the site of Hackney first station. The street level building for the second station is seen at the top to the right of the line.